Knitting varies from crochet in that various loops are “active”. The active loops are holding on a knitting needle till then another loop can be passed through them. Knitting can be made in two methods in Apparel Industry, they are: Warp knitting and Weft knitting. Warp knitting is in order for the formation and interlinking of loops in a vertical direction on a lateral array of needles with at least one separate yarn being supplied to each needle. The loops are connected together in a width-wise direction by moving the threads back and forth between adjacent needles. Warp knitting represents the easier and quickest method of producing yarn into fabrics. Warp knitting varies from weft knitting in that each needle loops its own strand or yarn. The needles make corresponding rows of loops at the same time that are interlocked in a crisscross pattern. Fabric is produced in sheet or flat formation using several set of warp yarns. Warp knitting is general in lingerie fabric such as Tricot. Warp knitting is usually done by machine only; knitting machines are using a special mechanical method to construct the outcome [Fabric] almost nearly produced by hand-knitting. Warp knit fabrics are very well accepted due to their many functions such as softness, fineness, wrinkle resistance, shrinkage resistance, strength and scratch resistance. Raschel machines are really helpful because they can precede the process of all yarn types in all forms (combed, carded, filament, staple). Warp knitting can also be used to produce mound fabrics regularly used for upholstery. 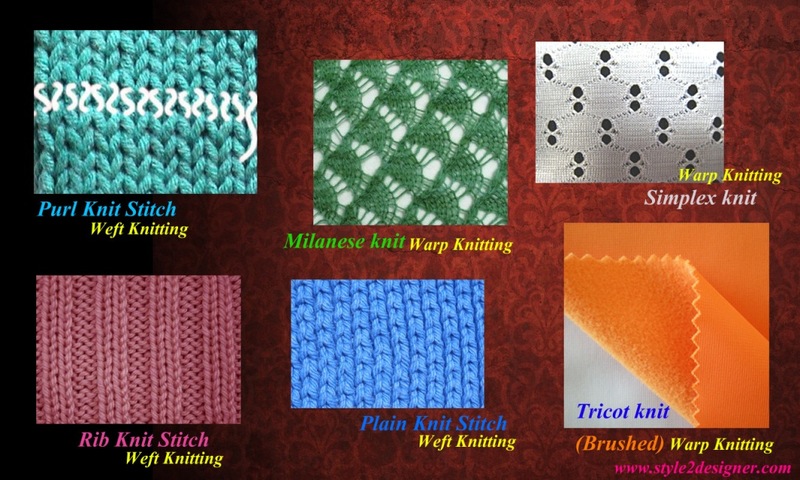 Any other sewing type is a variation of these plain knit, purl and rib stitches. Hand knitting is essentially weft knitting. When fabric is produced through the weft knitting machines, individual yarn is fed to a single or multiple needles at a time. A weft-knitted fabric consists of horizontal, vertical courses of yarn and necessarily needs only a single yarn. By difference, warp knitting needs single yarn for every stitch in the row (course), these yarns make vertical parallel Wales. Weft knitting can be done by machine or by hand. Hand-knitted fabrics are usually instigated by structuring a base sequence of twisted loops of yarn on a knitting needle. To create a new stitch, the second knitting needle is used to attain through each of these loops called stitches, in progression to pull a new loop from the functioning ball of yarn back through the first loop. Work can carry on in the round knitting called circular knitting method or by going back and forward in rows called flat knitting process.